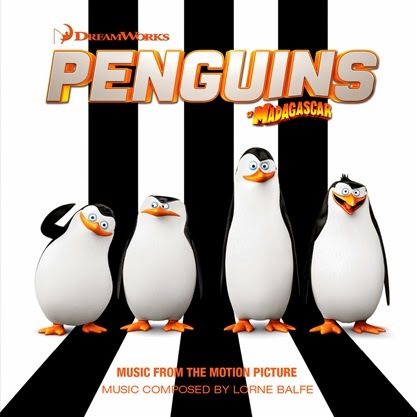 Composer Lorne Balfe is proud to announce the release of THE PENGUINS OF MADAGASCAR – Music From the Motion Picture by Relativity Music Group on November 24, 2014. “Working on the score for Penguins was a tremendous adventure. Every day I spent writing the score was filled with laughing fits over the penguins’ antics and the mischief they get up to in this film,” said Balfe. The DreamWorks Animation Thanksgiving family adventure movie, Penguins of Madagascar will be released in theaters nationwide on November 26th. A special Christmas compilation, The Penguins of Madagascar: Black & White Christmas Album featuring music by The Penguins of Madagascar will also be available for purchase via iTunes and Amazon on November 24th. In DreamWorks Animation’s PG Thanksgiving family adventure movie, super spy teams aren’t born…they’re hatched. Discover the secrets of the greatest and most hilarious covert birds in the global espionage biz: Skipper, Kowalski, Rico and Private. These elitists of the elite are joining forces with a chic undercover organization, The North Wind, led by handsome and husky Agent Classified (we could tell you his name, but then…you know), voiced by Benedict Cumberbatch. Together, they must stop the villainous Dr. Octavius Brine, voiced by John Malkovich, from destroying the world, as we know it. The Penguins of Madagascar was directed by Eric Darnell and Simon J. Smith; written by John Aboud and Michael Colton; and produced by Tom McGrath, Mireille Soria, Eric Darnell, Lara Breay and Mark Swift.